for Electronics, Screens, Keyboards, etc. 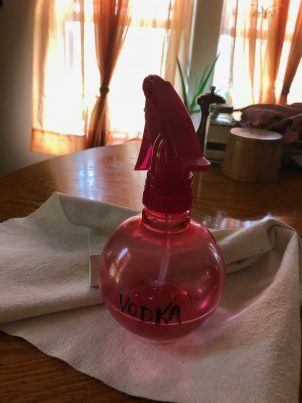 Put your cheap rot-gut vodka in a spray bottle. Just spray and wipe down with a soft cotton cloth. Vodka is higher proof (more alcohol) than most rubbing alcohols and less likely to leave behind moisture in your electronics. Add a drop of pine oil to it is nice.